A medium size van is well suited for a number of different purposes and at Edinburgh Van Rental we have a fleet of medium vans to hire at great rates. Whatever the reason you need to rent a medium size van, whether it's hauling bulky items or a trip out to Straiton to visit Ikea, our vehicles are clean, modern and fuel efficient. Driving a medium size van is very similar to driving a slightly larger car with intuitive controls and all the creature comforts you'd expect. Ready to hire a medium size van? Call us on 0131 207 0035, use the form on our contact page or Book Online! Here's a list of specifications for our medium vans. Please note that due to the variety of different models in our medium size van fleet the information above is based on averages. If you have a specific request regarding vehicle model or dimensions please contact us and we'll do our best to meet your needs. 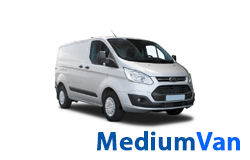 Do you need a medium size van on a weekly or monthly basis? Check out our long term hire solutions.